The brethren of Anchorsholme Lodge No 5854 welcomed friends and guests to celebrate Alan Whittingham’s 50 years in Freemasonry. The master, David Edwards, conducted the early business of the lodge with great style and welcomed Harry Cox Past Assistant Provincial Grand Master accompanied by Peter Greathead North Fylde Group Chairman, Geoff Pritchard, Keith Jackson and John Pitches supported by Provincial Deputy Grand Director of Ceremonies Jason Dell. David formally welcomed Harry Cox and invited him to occupy the chair, Harry then proceeded to invite the tyler into the lodge and asked Jason Dell to place the celebrant before him. Harry started by saying that he had known Alan for 40 years and that it was a privilege to preside over the evening’s proceedings. Harry started his presentation by providing a backdrop to Alan’s birth year, 1945, which was an eventful year when the Nazis were defeated and the allies won the Second World War. The troops were coming ‘home’ and people were optimistic for the future and Alan James Whittingham was born at West Lea, Out Rawcliffe on 31 May 1945, the third child to Doris and Henry Whittingham. Alan has two elder sisters Kathleen and Doris as well as a younger sister Marilyn. He also had a younger brother Henry who unfortunately passed away at birth. Alan came from a farming family. His father Henry was the son of Isabell and Henry Whittingham who bought the Wild Boar Farm in 1927, in the Samlesbury area which was a mixed farm, milking 60 cows. The farm had difficulties selling the milk in the days before the Milk Marketing Board was formed. Because the sales of the milk proved so ‘hit and miss’, Alan’s grandfather built a purpose built dairy, thermostatically controlled and employing approximately 12 staff. This produced mainly Lancashire cheese either selling at markets or being collected from the farm. Following on from this in the early 30’s they built a state of the art ‘Danish piggery’. Later when the Milk Marketing Board was formed the farm went back to selling milk as a product which was sold around the Blackpool area. Alan’s father took over the farm in 1953. His four brothers and a sister also worked on the farm. Unfortunately two of the brothers died in accidents on the farm. Alan’s father dealt in cattle attending markets and buying and selling livestock for other farmers. When Alan’s father was 21 years of age he was struck down with tuberculosis and had a lung removed, Henry spent six months in hospital recuperating and meant that he had to cut back on the day to day running of the farm. Alan attended Out Rawcliffe Primary School, moving to St Michael’s Primary School before attending Hodgson School in Poulton-le-Fylde. It was during this time that Alan met many Masons although Alan did not know it at the time. Pupils such as Edwin Fisher, Russell Forsyth, David Elwell, John Chew, Geoff Pritchard, Jay Hogg and David Kirkham and not forgetting one of Alan’s teachers, Malcolm Burrill. Although a Rugby Union fan, Alan always played football at school and later on leaving school and playing for Great Eccleston, they had many trophies to show that he was a useful player. The only rugby match he can really remember playing in was a practice match held at school and when he was left on the field when everybody ran into the changing room on a cold freezing day. The culprit on that occasion was a certain teacher named Malcolm Burrell and Alan was left with a fractured bone in the ankle. Pictured from left to right, are school friends: Russell Forsythe, Geoff Pritchard, Malcolm Burrill, Alan Whittingham, David Kirkham and Edwin Fisher. It was at the age of 12 or 13 years, while attending Hodgson School that he started a lucrative business. Alan’s father had taken him to one side stating that since the farm had stopped making cheese, the piggery was now empty and if he wanted to fill it with pigs he would stand guarantor at the bank. Indeed, Alan worked hard before and after school managing approximately 600 pigs per year and selling them all over the Fylde coast. Alan met his wife-to-be, Lucy, at St Michael’s Village Hall. Lucy at that time lived at Pilling and she was the football ‘Queen’ that night. In Alan’s words: “she was stunning”, and the rest as they say is history with the couple celebrating over 53 years of marriage. Alan and Lucy have four sons, Ian, a lawn doctor, Paul an auto electrician, Simon a project manager and David, who received a first-class honours degree in pharmaceuticals and is now a Chief Executive. All attended St Michael’s Junior School and either Garstang High or Kirkham Grammar School. Alan and Lucy have eight grandchildren, four girls and four boys. Alan has always had farming in his blood and took over from his father in 1978 and proceeded to increase the capacity and range of the farm to 150 dairy cows. Alan also rented land at Singleton for 400 sheep increasing the acreage to a total of 290; 150 acres at Wild Boar, with another 140 acres at Singleton, a very productive farm at the time. Eventually in 2000 he decided to sell the farm and retired back to Out Rawcliffe. Harry moved on to Alan’s journey into Freemasonry. Alan’s father Henry was initiated into Freemasonry on 24 May 1947, proposed by Archibald Clucas, the second founder on the list of Anchorsholme Lodge Founders, and the second WM of the lodge. Alan’s father was WM of Anchorsholme Lodge in 1961 and celebrated 50 years in Freemasonry at home due to illness, the first initiate of Anchorsholme Lodge to achieve 50 years in the Craft. Alan’s father proposed him into Anchorsholme Lodge on 3 January 1969 at the age of 23 years. At this point Harry asked the lodge secretary Terry Murtagh to read a précis of the minutes from Alan’s initiation which saw an impressive 65 people attending the ceremony. In April 1971 Alan was joined by his brother-in-law Neil Beaumont who tragically passed away in 1968. 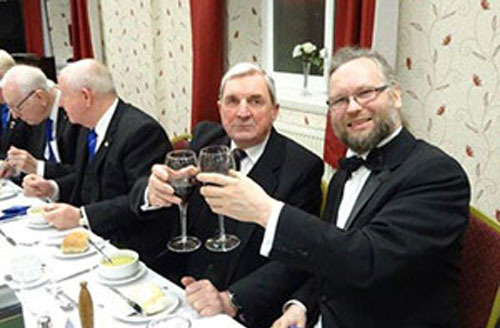 Alan Whittingham (centre) and Anchorsholme Lodge WM, David Edwards (right). Alan became a steward of the lodge in 1972, an office he served for five years, Alan then went on to serve as inner guard and junior deacon, and because of a death in the lodge Alan moved up to junior warden, senior warden and was installed as the master in 1982. Anchorsholme Lodge tyled at 3:00pm on installation day and on that occasion, there were 43 members and 77 visitors present, an impressive 120 in total. The representing officer was B Rowlands, the Provincial Junior Grand Warden of the Province. Alan was presented by his very proud father Henry Whittingham and installed by Cecil Wharton the WM. The working tools were presented by David Maddison, Harry Cox and Stanley Giles. Alan also appointed 12 stewards on that day! The address to the master was given by his seconder Jim Crook. Alan had a very busy year with three initiations, two ceremonies of passing and two raisings, and at the Old English Night an explanation of the second degree tracing board was given by the junior brethren. 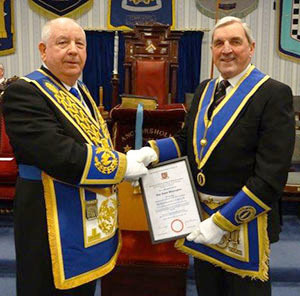 In February he installed his successor Jack Roskell. He also proposed four candidates; Edwin Fisher, James Hogg, Chris Adams, and Alan Thompson. In October, Lucy had her ladies evening at the Winter Gardens, dining in the Baronial Hall and dancing in the Spanish Hall. This event was supported by over 200 guests including their four boys all suitably dressed in dinner suits. Alan was appointed charity steward in 1984, an office in which Alan served for 13 years. During Alan’s tenure of office, the sums given to charity by the lodge went through the roof with sums exceeding £2,000. During that time the lodge had numerous social events, all very well supported, which served to boost the recruitment of members for the lodge and raised high sums for Masonic charities. Alan’s contribution to Masonry in general and particularly to Anchorsholme Lodge was soon recognised and he was appointed to Provincial Grand Lodge as a Past Provincial Senior Grand Deacon in 1992 and promoted to Past Provincial Junior Grand Warden in 2000. Harry said that Alan was the third initiate of Anchorsholme Lodge to achieve 50 years in Freemasonry, but the first to celebrate it in the lodge; Harry added that over the past 50 years Alan has proved himself a man of consummate integrity and commitment. Harry asked Peter Greathead to read the certificate issued by the Provincial Grand Master Tony Harrison, which he then had great pleasurer in presenting it to Alan. Harry concluded by wishing Alan, health, happiness and fulfilment in his Freemasonry and in all that he does. He asked Alan to convey the lodge’s sincere thanks to Lucy for the support that she gives him. Harry presented Alan with the script from the evening. At his point Harry asked David to resume his rightful place as master of the lodge. At a well-attended festive board Alan thanked Harry Cox for a moving tribute to his life, and all the members of the lodge past and present for their help and support over the past 50 years. Pictured from left to right, are: John Pitches, Duncan Smith, Geoff Pritchard, Keith Jackson, Harry Cox, Alan Whittingham, David Edwards, Peter Greathead and Jason Dell.